SCOTT FARLEY of Kenova, WV hunted with us in February, 2006. We were lucky enough to get a little snow for tracking and Scott was able to get himself this tom on the first day of his hunt. 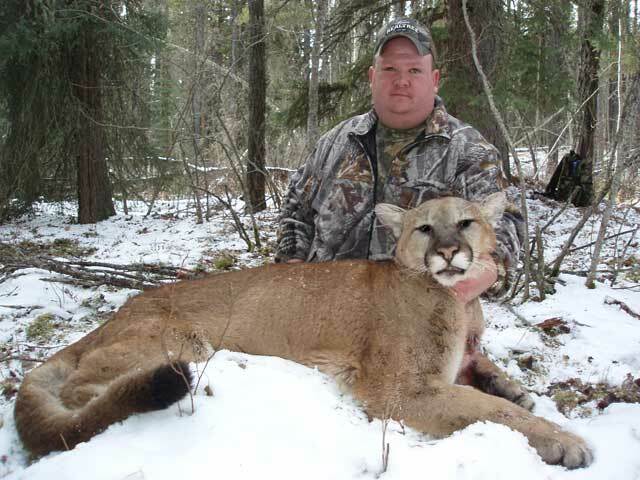 TOM RADCLIFFE of Denver, PA, came up to Alberta in February to get in on a cougar hunt with us. He had to make the trip twice due to poor snow conditions the first time out, but was rewarded with this great record book cat for his efforts. The official Boone and Crockett score is 15 2/16''. KEN MARTIN of Windsor, ON came west for the unique opportunity to hunt pronghorn antelope in southeastern Alberta's prairies and took this nice buck. Ken was using a .25-06 Rem. with 100 grain Barnes X Triple Shock bullets. ADAM RADOLINSKI, of South Wales, NY harvested this nice pronghorn buck on the second morning of his hunt . ADAM was fortunate to get this great whitetail buck hunting on horseback in the mountains a few days later. LOUBERT SUDDABY of Orchard Park, NY harvested this heavy horned antelope the day after his friend Adam during the same September hunt. PAUL MORTON of Gray, ME came to Alberta in October looking for the opportunity to get a big antelope. Luck was with him as he scored on this terrific pronghorn on the first morning. KEN BOOTHBY of Buxton, ME joined his friend and longtime hunting partner Paul, so he could experience his first outfitted hunt. He was thrilled to harvest this true trophy buck the very next day. IVAN FLORES of Sonora, MX, is all smiles after he took this nice 45" Shiras bull moose on the first morning of his hunt. DAVID ARTHUR of St. Charles, MO, for the third year in a row, made a great shot on the first day of his November hunt to get himself another nice Alberta muley. ROSS JACKSON of Golden, CO, connected on this high racked prairie muley. Ross, along with his buddy Dave above, was on his third hunt with us. GARY ROBBINS of Sylmar, CA, scored on this beautiful muley buck on the second day of his hunt. SUSAN TUOHY of Alpena, MI, took this high & wide prairie Muley to add to her collection of trophy Alberta deer. She also took a great muley on a mountain hunt last year. SCOTT BURNETT of Cut Bank, MT who took a big Boone and Crockett cougar with us last year (see the Highlights of 2005), was able to connect on this big drop-tined mule deer the first day of his hunt . Scott also took this whitetail deer before his hunt was over. MIKE COLE of Graham, WA came on his first hunt with us, joining his pal Wayne Smith. Mike took this beautiful mule deer on sunny November day on the the prairie. He used a .325 WSM with 180 grain Barnes X Triple Shock bullets. WAYNE SMITH also of Graham, WA hunted with us for his second time and took this nice 4X4 buck on a very cold day near the end of his hunt. Thanks to everyone who joined us and made 2006 another memorable year for us. We truly enjoyed sharing the rewards of the hunt with you! Carl Ellingson, Carole Frei, Dale Silbernagel, Gary Villemaire, John Gordon, plus Don, Toni and Kim Grayson. We couldn't have done it without you!